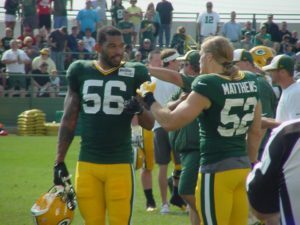 According to an ESPN report, Green Bay Packers linebackers Clay Matthews and Julius Peppers, along with Pittsburgh Steelers linebacker James Harrison, have agreed to meet with NFL investigators. The league threatened suspension if the players didn’t agree to discuss steroid allegations related to an Al-Jazeera report in January. Former Packers linebacker Mike Neal, a current free agent, has yet to agree to meet with the league. According ESPN’s Chris Mortensen, Harrison will meet Aug. 29 at the team facility. The date(s) for Matthews and Peppers has not been revealed. Earlier, the NFLPA had issued statements to the league on behalf of the players. But the NFL says the players have an obligation to submit to an interview but also the duty to provide meaningful responses to the questions posed.